IC and Component Sockets are commonly used where excessive heat from the soldering operation would over-stress sensitive integrated circuits. By soldering the empty socket to the printed circuit board, the IC can simply be inserted into the socket, using friction alone to secure the component. This method is also used where flexibility in the design is desired, providing the ability to quickly and easily swap out components. IC and Component Sockets are also used as adapters. Both standard and custom socket adapters are available to allow, for example, a through-hole component to be mounted on a surface-mount board or vice versa. 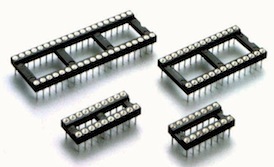 Manufacturers of IC and Component Sockets include TE Connectivity, Molex, Amphenol, Delphi, Yamaichi, FCI, Foxconn, and SMK Corporation. Procure International offers both current production and obsolete IC and Component Sockets from most of the world’s manufacturers at very competitive prices and short lead times. Search for the IC and Component Sockets you need using the Part Number Search bar at the top of this page, submit your RFQ to get pricing, and place your order directly online using our secure online ordering process.